Our red-suited World Series champions (doesn&apos;t that have a nice ring to it?) may be done for the season, but &apos;tis the season to start paying homage to another red-suited, heavily bearded champion of sorts. Ready or not, here comes Santa Claus. The jolly gent has a packed schedule, but he will be making time to celebrate the holidays in style as the featured guest at Boston-area concerts. The world-famous Boston Pops will be busting out the jingle bells at its annual Holiday Pops performances at Symphony Hall. The program will include sing-alongs and, at special kids matinee presentations, exclusive photo-ops with the distinguished Mr. C as well as what the Pops promise will be "special treats" (so you better be good for goodness sake). You could even plan to have dinner with the show by purchasing meals and drinks at Symphony Hall. 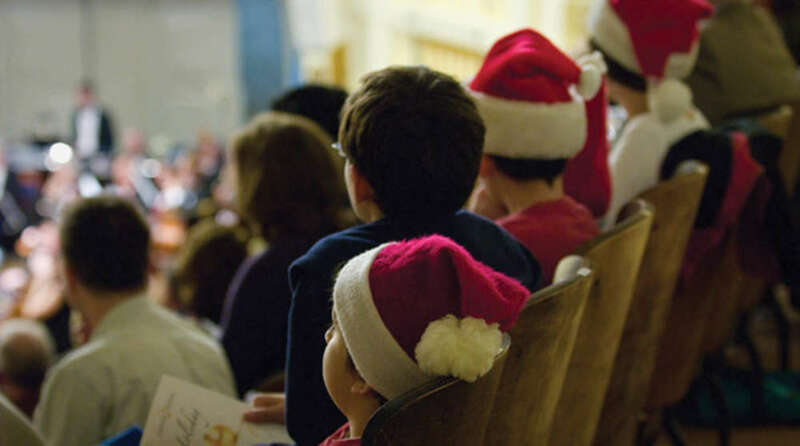 The holidays will be popping in historic Lexington as well when the Lexington Symphony presents its own Holiday Pops performances. The festive events will include carols (of course) that, in addition to audience sing-alongs, will be sung by choral groups. Santa will be accompanied by some of his elves at the concerts. December 6, 4 p.m. and 8 p.m.
Photo: Lexington Symphony. Used with permission.